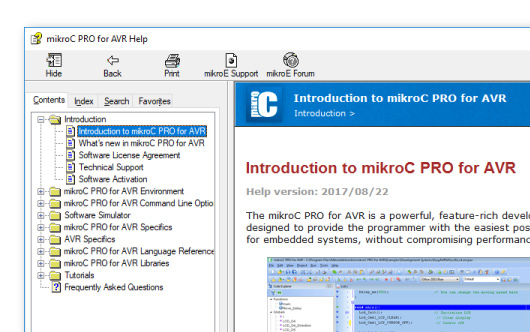 The mikroC PRO for AVR currently supports 207 AVR and we are constantly adding new ones. Visual TFT supports 17 TFT controllers and multiple different display resolutions. So, we even have the hardware prepared for your next graphic project. 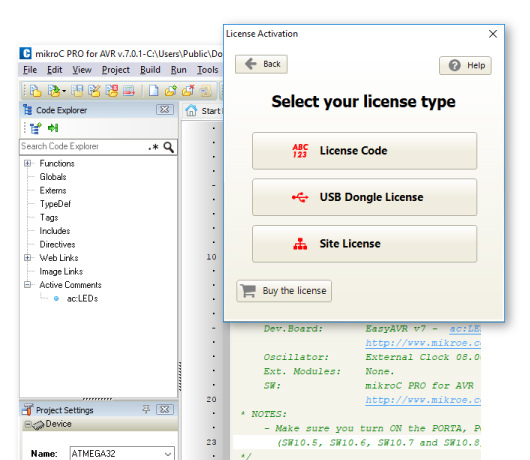 Own, manage, and deploy multiple software licenses. 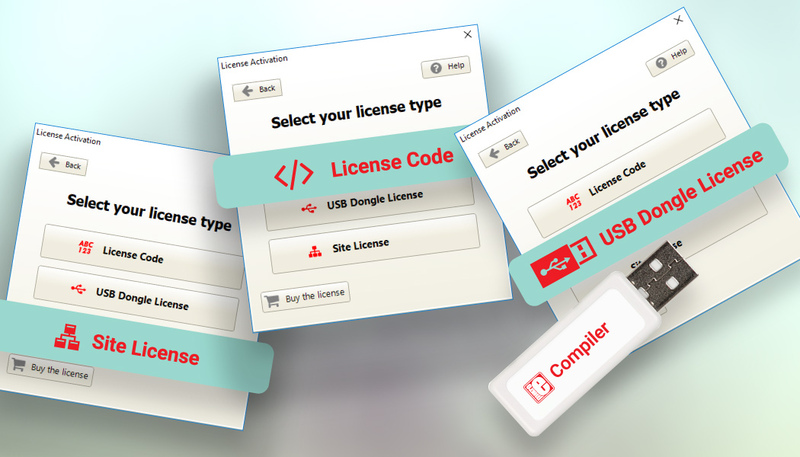 Instead of buying several licenses at a regular price, use the Site License option and get licenses for your whole team or class at a special price. Learn more. With the integrated Visual TFT you can create amazing user interfaces, simply drag and drop visual elements and the compiler will generate the code for you. Save time and focus on making your graphic design the best possible. Manage all your data quickly and easily. Make the workspace comfortable and suited to your need. 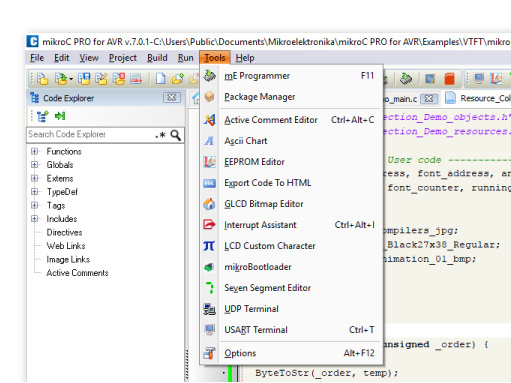 Use the default layout of the IDE, or arrange the windows manually. 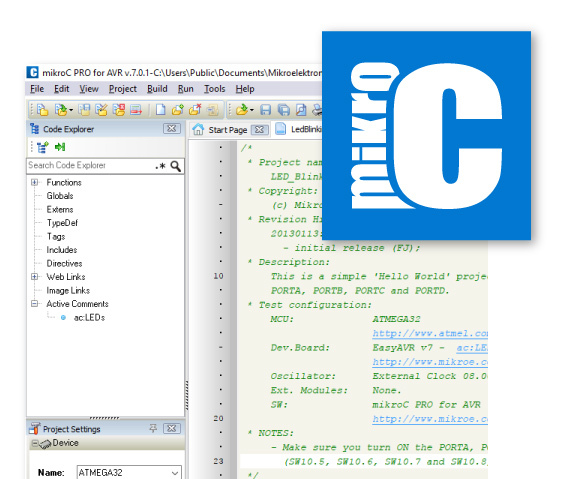 Navigate through all the projects you are working seamlessly and save time with the intuitive IDE of the mikroC compiler. 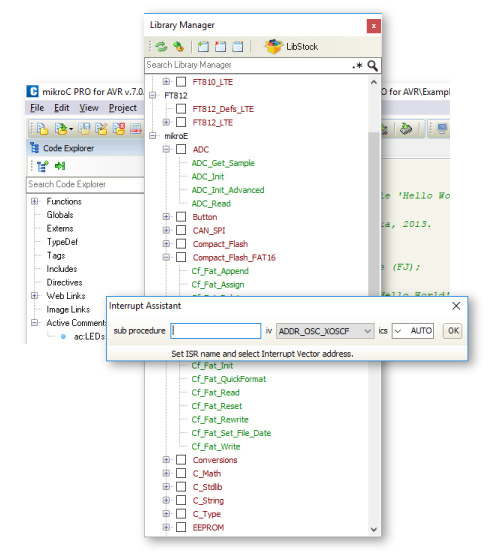 Edit Project gives you a full overview of the entire set of configuration bits in each chip. Select only among listed options, described in simple terms. 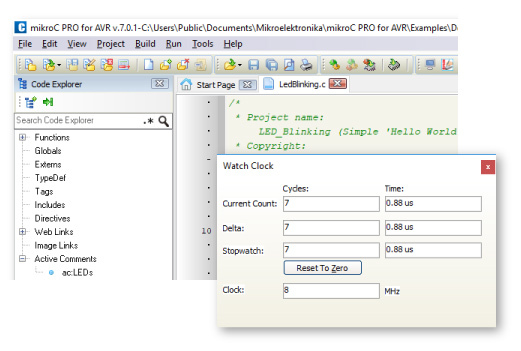 Edit project includes predefined schemes of oscillator settings for most widely used microcontrollers. Simply load your desired scheme, and you are ready to go. Don’t waste your time browsing for examples. Let them come to you. New Project Explorer window leads you to your projects. It displays all of compiler’s many included examples by default. But simply point the path to any other folder and fast recursion-search algorithm will extract all of projects inside and will display a tree view of your project files up to any depth. Double click opens the project and sets it as active. Easily switch between the projects as often as you want. 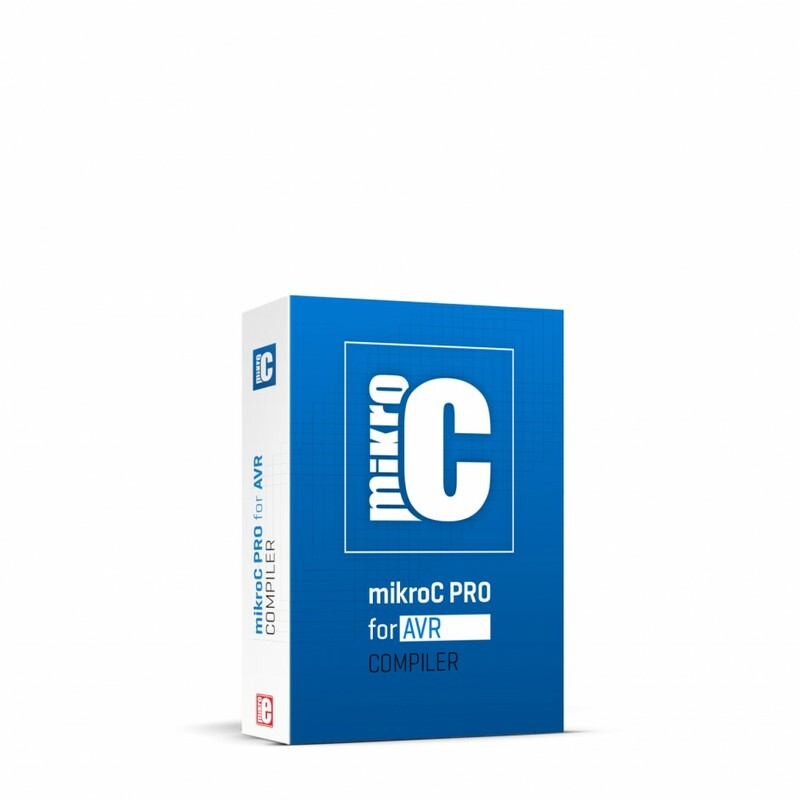 Only mikroC offers the unique mechanism to easily use any available library in your project. Special OneClick technology allows you to speed up your development. Just click on the checkboxes of the libraries you need and they will be instantly available in your code. 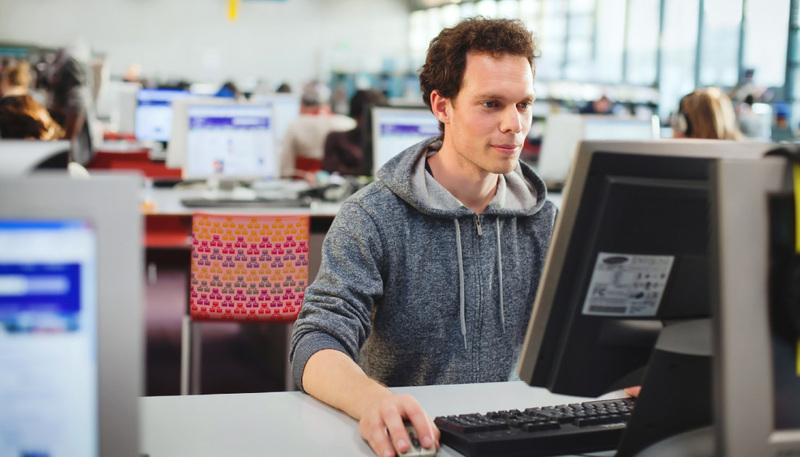 As we always think one step ahead, we programmed Library manager to allow easy usage of third party libraries installed with Package Manager software. 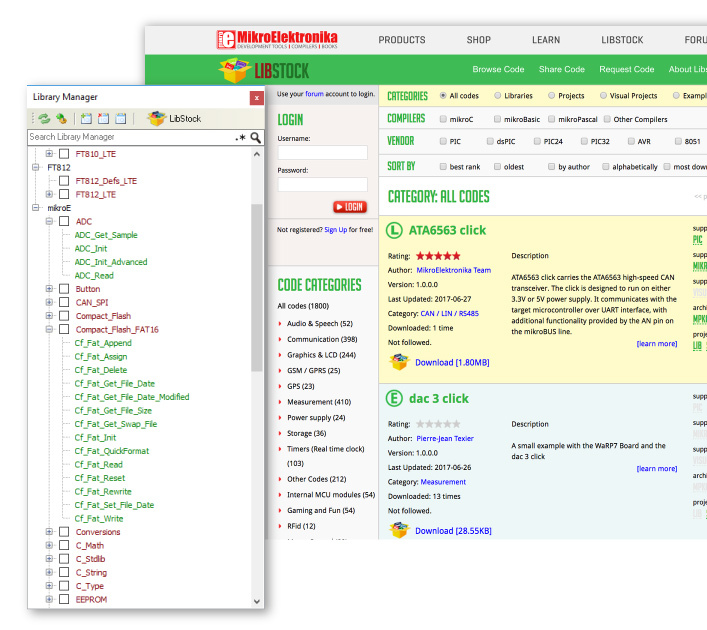 Notice: Visit LibStock and download fully functional and working projects, and install them with a single click. Use Code Completion for all those times when you need to list identifier names that contain a certain word, or when you only know a part of the identifier name. Simply type \* in the Code Editor, followed by the phrase, and presses Ctrl+Space - a list of identifiers containing this phrase will be shown. Easily declare a local variable. 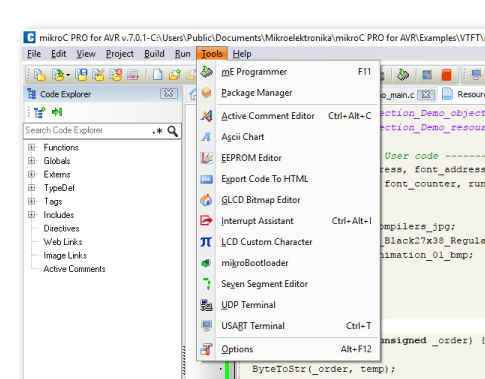 First, enter the desired variable's name in the Code Editor. Then select this option from Edit menu (Shift+Ctrl+V). 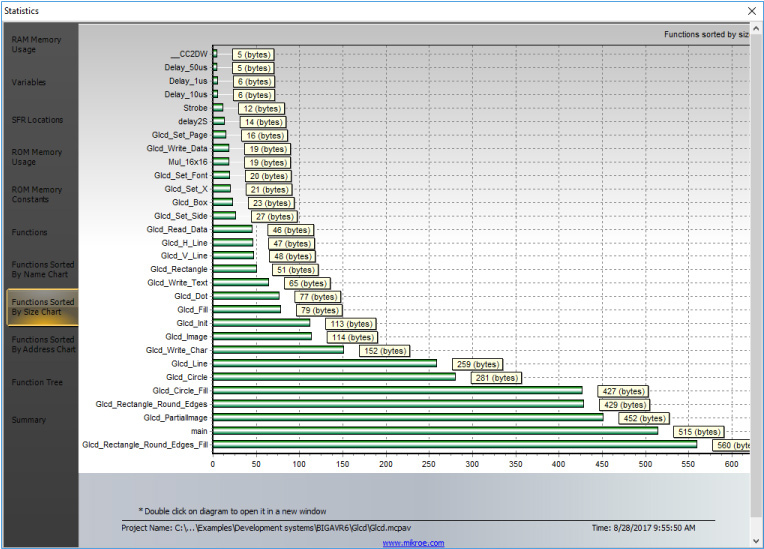 Here you can the select variable type, dimension, and add a volatile qualifier if needed. After pressing the OK button, a variable declaration will be placed. 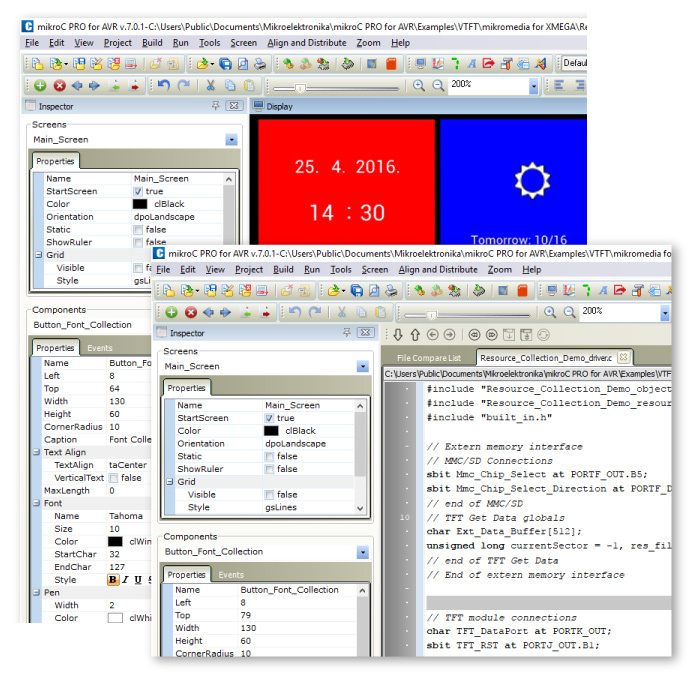 The live update of the AVR compilers (version 7.0.1) fixes and improves the user experience in the Visual TFT mode. 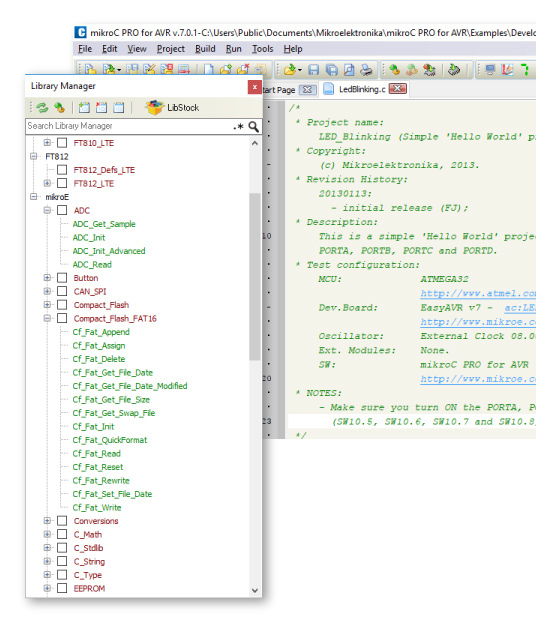 List of features applies to all three languages (mikroC, mikroPascal, mikroBasic) unless specified otherwise. See the Project Log for the full list of new features, improvements, and fixes. 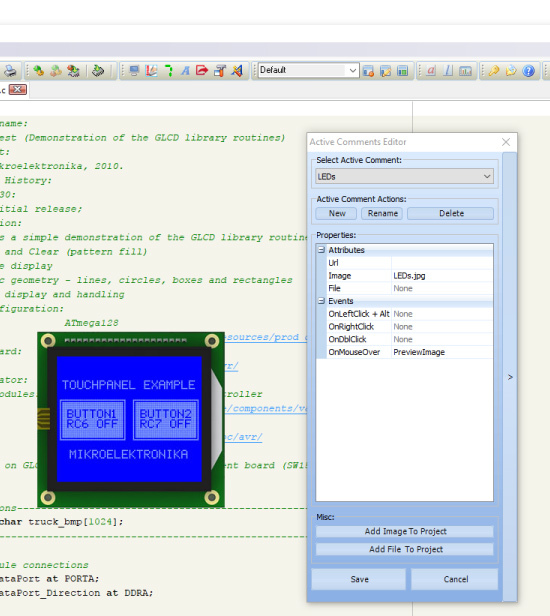 The new 7.00 version of the AVR compilers integrates Visual TFT, the GUI design software. Release date: May 11, 2017. Fixed: Incorrect arithmetic division of signed integers by powers of two. Fixed: Incorrect initialization of globals and statics in certain cases. Fixed: Incorrect parameter passing in certain cases. Fixed: Coff file generation failed in a certain case. Library Manager now can open library source on right click, if the source is present. Added a new view to Project Manager to support displaying complex project sub tree. Export Project now exports whole folder structure. Clean Project Folder cleans whole folder structure. Cleaning changed from selecting specific files to selecting file types to clean. 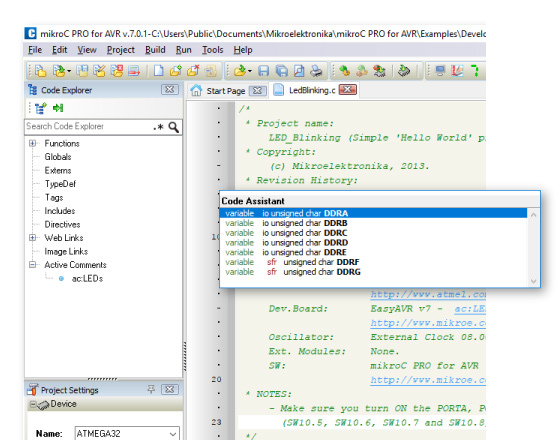 Edit search paths form improved to work with relative search and header paths. IDE couldn't find AVR FLASH if it was installed for "All Users"
Fixed: Removing non-existing file from ProjectManager in some cases caused IDE to halt. New: Added assert.h and stdbool.h header files. Improved: Faster optimization and linkage. Improved: Allocation of locals to registers. Fixed: Call tree generator did not work for specific examples. Fixed: Pointer to types that has overridden memory specifier was incorrectly dereferenced. Improved: Function tree changed to work with new call tree generator. New: Added support for new TFT controller ILI9341 in both 8bit nad 16bit mode. New: Breakpoints are now saved to file. New: Breakpoints are loaded when opening file. 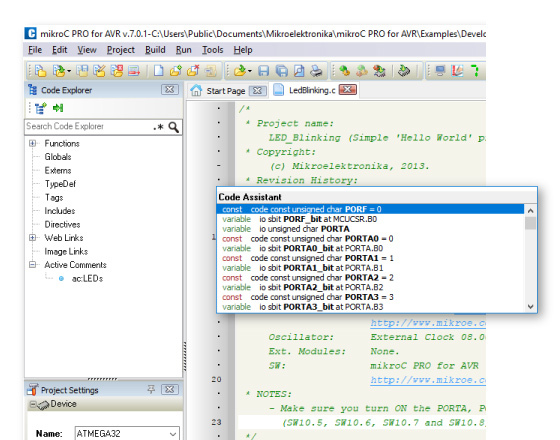 We have introduced Project Explorer, a great new window for easier access to the examples and your projects. It uses fast recursion algorithms for fast searching of your project files within folder tree. You'll get used to it quickly, and you'll love working with it. Specially upgraded to include struct field members, and should work for any structure depth (does not ignore scope any more). If there are several objects with same name but different scope, only ones visible in current scope are shown. We did the same with Find Declaration and Run-time value hints. Improved: Statistics is no longer a "modal" window, but rather "stay on top"
New! Added routines for work with images and fonts stored on external resourse (MMC/SD card, external flash, etc.). Routines added for TFT, GLCD, T6963C and S1D13700 libraries. New! 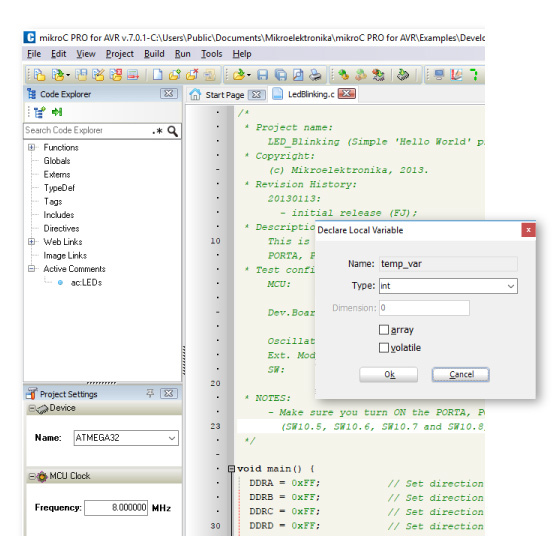 Added functions for writing text stored in flash for TFT, GLCD, T6963C and S1D13700 libraries. Improved! 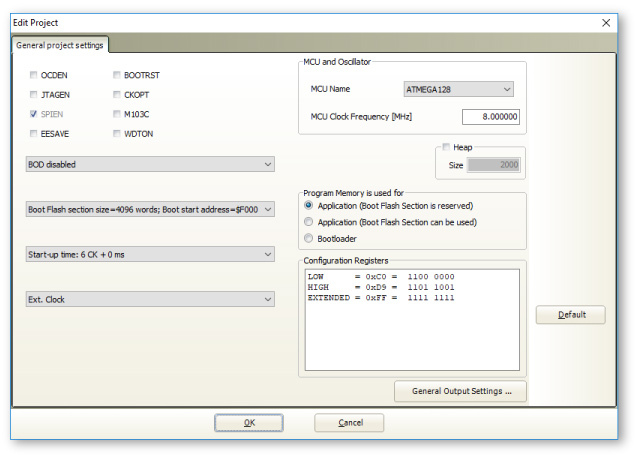 MMC library, added functions for multi read block mode. Improved! UART Library, added generic routines which uses the active UART module. Improved! SPI Library, added generic routines which uses the active SPI module.